Today’s contact centres represent the front line for organisations battling to attract and retain customers. With customer engagement the hot new business catch-phrase, more and more businesses are beginning to understand that customer service is the key battleground on which they must fight for their competitive futures. And their contact centres sit right on the front line. In today’s hyper-connected world where customers expect round-the-clock access to good service, 365 days a year – and have easy access to social media where they can broadcast their dissatisfaction to audiences of millions – the statistics could not be more compelling. Almost four-fifths of people (77%) say valuing their time is the most important thing a company can do to provide them with good service, according to Forrester Research. Half of all customers say they have stopped doing business because of poor customer service, according to Conversion, and the proportion rises amongst millennials. Against this backdrop, how do businesses future-proof the way in which they interact with their customers? The answer is that they must embrace modernised contact centres able to exploit emerging technologies to deliver better customer service than ever. For large organisations, that implies a move towards outsourced unified communications – contact centres able to offer one-stop, multi-channel customer services, including telephone answering on a customer helpdesk, answering email enquiries, SMS messaging, web chat, social media contact and more. Smaller organisations may not need such an expansive service – at least not at the earlier stages of their development – but could certainly derive value from outsourced virtual receptionists, able to offer a more professional service level. Above all, the key is to start from the position that good customer service is now the key differentiator between products and brands. Organisations that recognise this imperative will very quickly appreciate that providing good service requires a multi-channel response. Research from Ovum shows that while 25% of consumers use only one or two channels when seeking customer care, 52% use three or four. For both customers and customer service agents then, providing consistent levels of service across seamlessly integrated channels, is a key challenge for modern contact centres. Nor should organisations fall into the trap of making assumptions about their customers. It would be wrong, for example, to assume that an older customer base will not choose social media as a communications channel – research suggests that many older people do exactly that – or that younger customers won’t continue to use the phone. Personal service and human interaction will continue to be valued by customers of all ages. Contact centres’ ability to meet these broad needs seamlessly and successfully will inevitably depend on the way in which organisations embrace new technologies, which are evolving at pace in this sector. 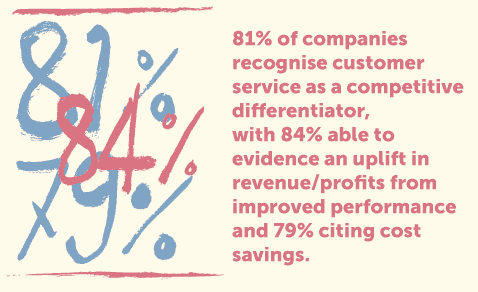 Automation and digitalisation enable contact centres to deliver improved customer service outcomes and to quickly scale their operations up and down according to need. Moreover, contact centres’ investment in new technologies is creating new opportunities, as well as enabling an improved response to existing customer service challenges. One important point is that automation frees up human resources for deployment to more demanding cases, while simple customer queries can be dealt with by a machine-based response. In other words, agents can focus on the more complicated or difficult requests. Moving beyond the benefit of more efficient resource allocation, however, the modern contact centre now has the potential to be a powerful weapon in an organisation’s data insight operation. Marketing and sales teams, for example, will increasingly look to exploit the insight captured by their contact centres – across every channel – to deliver better campaigns in the future. Product development teams will hope to use this insight to hone their design and execution of future products and services. 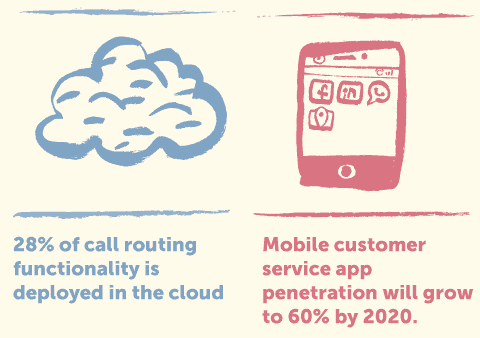 When such insights drive business activity, the contact centre market will have completed a remarkable pivot. Where the company’s call centre was once likely to be a source of customer frustration, it can in future be the engine that powers improved customer satisfaction and an even more attractive customer proposition.